Edward John Adams or Edward James Adams, featured in ‘Common Surname Trouble – Adams in Birmingham’, presented an identification challenge. This marriage appears to be his second. Evidence from census, birth and marriage records suggest that Edward John Adams, started out working as a butcher in the 1840s, then became a jeweller and retired around 1870. He was widowed before 1861, so was free to remarry. He had a son, also named Edward, born ca 1837. Another younger Edward J Adams or Edward James Adams worked as a jeweller from the 1870s and had diversified into watch and clock making by the 1890s. The ages of this Edward indicate a birth date ca 1837, which is consistent with him being Edward John’s son. 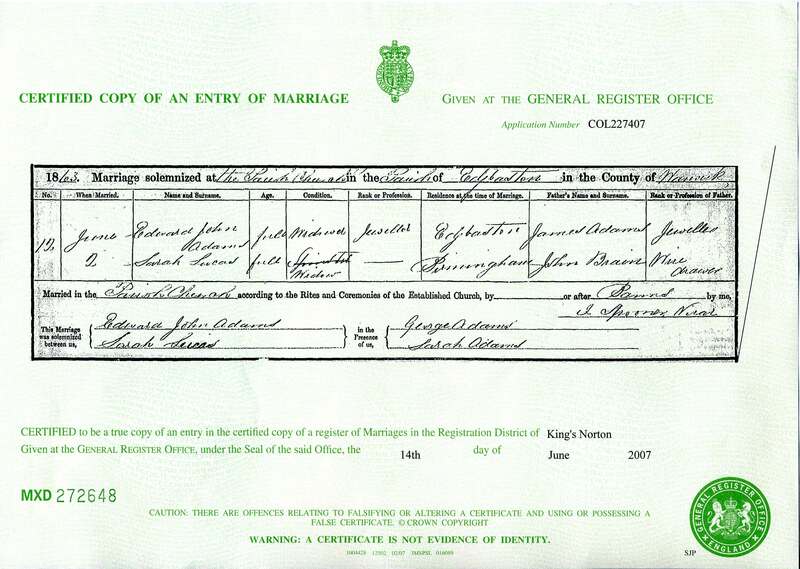 The records that associate Edward senior with his second wife, Sarah, only give a middle initial J, leaving room for doubt about whether he is the same person the man who married Mary Foster in 1834. Entries for private residents, usually the more affluent and respectable people, do not give the exact street address. Tyburn, Erdington is very close to Kingsbury Road, so I am reasonably sure that the resident Edward John Adams is the same person as the jeweller at Spring Villa on the 1881 census. This census indicates that wife Sarah was born ca 1820 and the birthplace for both is recorded as Warwick, probably meaning the county, which is a bit vague. Sarah appears on the 1851 census with her first husband James Lucas and son William, and as a widow on the 1861 census with William. Sarah Lucas, nee Brain’s birth date, reported as ca 1820, matches the jeweller’s wife at Spring Villa. The trade directory entries chart Edward John Adams’ jewellery business at Sand Pits and Kenion Street in the Jewellery Quarter and his retirement to the suburbs. Edward James Adams expanded his business, occupying Jewellery Quarter premises in Spencer Street and St Paul’s Square as well as nearby city centre premises, whilst residing in Acock’s Green. This all started with my confusion over the inconsistent naming of Thomas Adams’ father on his marriage certificate. I am now convinced that the middle name James was an error. I am also ready to conclude that Edward John Adams married twice. The second marriage names his father as James Adams, a jeweller, an elusive piece of information.